Don't press more than one button at a time. In other words, don't ever press two or more buttons simultaneously. This is not an official term, it's just what I decided sounds best. It is known that trying to do the SMW equivalent of the SMB walkathon is impossible. Not pressing either of the run buttons (X and Y) also means you can't hold or throw items, such as the Mechakoopa to defeat Bowser. There was this one submission precisely 12 years ago trying to get around it by never running (run button + direction). It was rejected for being a somewhat arbitrary goal, because the run button was still used, just not in certain scenarios. So then I had the idea for this run. It turns out limiting the player to only a single button per frame is a very effective way to create a similar effect. 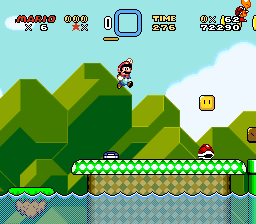 In SMW, you have to press the run button while pressing a direction to get higher speeds. Since this is prohibited, you have to get creative when trying to be fast. Your walking speed is capped at 21 [sixteenth of a pixel per frame]. Jumping on chucks will set it to 32. Sliding on slopes can also be used to increase the speed to sprinting speed and higher (to 51). Requires running. So it's impossible. Move into an item, hold it, then immediately drop it. 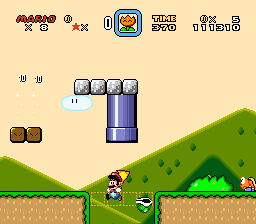 SMW sets a 16 frame timer on the item before you can interact with it again. Use this to jump a few frames before the timer runs out, while inside the item. Then grab the item. However, since you're now holding the item, your jump will only be small. Impossible. When grabbing a throw block from below, you either fall or you can move onto an adjacent block. Jumps are impossible. You can slide off edges though. You can hold an item and move in water. This only requires pressing Y or X, which will move you in the direction you're looking. However, the speed boost from 17 to 33 is only given if you also hold a direction. Otherwise it's exactly as slow as normal swimming. The chuck is used to increase the speed from 21 to 32. 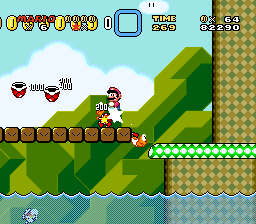 The brown platforms are walked on to push Mario forward. 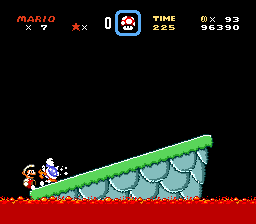 A screen scroll is used to make the white platforms spawn earlier so they're pushing Mario forward when walking on them. Interestingly enough, the jumps on the yellow bridge blocks were very close to being impossible without waiting. As already mentioned, you can't get out of the water if you fall in. So, rarely seen in TASes ever, the intended method of clearing the water is used. The feather is a great upgrade even if you can't fly. There is a 16 frame glide timer which starts when you hold a jump button. If it's non-zero, you will glide slowly instead of falling, even without holding the jump button further. This is useful because you can now use other buttons! Using the pipe to the bonus area and leaving is, incredibly enough, faster than jumping through the level normally. Even though you lose your 32 speed, the area skipped is large enough to make up for it. Alternating between ← and → is called 1/1 swimming. It speeds you up a little bit. Grabbing items is avoided because it doesn't give a speed boost, and also slows you down at first when you have a cape (due to spinning). Getting through the second boo ring without getting hit or waiting was incredibly close. 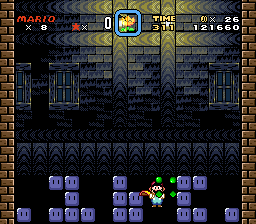 The Big Boo fight pattern was an interesting challenge because removing blocks from the lowest level requires an adjacent block on the lowest level. A level that looks normal. A bit surprising that the block zip worked so flawlessly here. 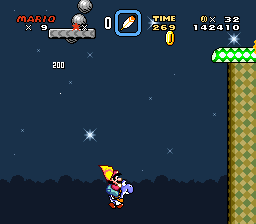 Star World 4 requires a Yoshi, and this level is very flat, so I could feed Yoshi without ever having to hold and reposition him. Having a Yoshi in this level helped as well, since moving the key would be tedious otherwise. Straight forward level. Having a blue Yoshi wasn't necessary, but allowed for more playaround. Also a simple item swap. Door 1 is an autoscroller, so it was skipped. Door 5 is the regular TAS route. It's the room where you have to run, so it was skipped for obvious reasons. Door 6 is a vertical water level, but we can't swim upwards quickly, so it was skipped. The first hit is delayed for a few frames. This is done as otherwise Bowser would throw the next Mechakoopa offscreen into a pit. Hello it's me, Masterjun! I made this run! This run was meant as a joke at first, but the unexpected challenges I had to overcome brought the game to a whole new light. In short, I had a lot of fun TASing this. Trying to be entertaining with such a limited toolset is a neat exercise. It's the reason why the Big Boo fight and the Bowser fight definitely took the longest to TAS. Of course, I didn't have any tools to confirm I was actually only pressing one button a frame. Of course I say, imagine if there was an easy way to write a Lua script to confirm it, crazy huh? Seems like I never got around to doing that. So then at 35k frames in I realized there was a double input at 8k frames... Well luckily I could fix the level and everything synced after that. TASVideos, the site of tool-assisted spaghetti movies, for hosting this spaghetti induced recipe, sponsored by Pasta Weaving Inc.
People who actually watch my silly runs!